July 25, 2011 - On Wednesday, American Airlines management announced that the company has ordered 460 new narrow-body planes, with options to purchase an additional 465. The company plans to acquire 260 planes from the Airbus A320 family and 200 Boeing 737s. The company will be taking advantage of approximately $13 billion of committed financing provided by the two manufacturers. “The APFA applauds American Airlines management’s decision to take the company in a new direction, diversify the fleet, and modernize the in-flight experience for passengers,” said Laura Glading, president of the Association of Professional Flight Attendants. The union is especially encouraged by the fuel efficiency these new planes will provide. This purchase represents a calculated and strategic move to bring American Airlines back to the forefront of this country’s aviation industry. That Boeing and Airbus were willing to provide American Airlines with favorable financing terms is a testament to the sacrifices that APFA’s membership and others made in 2003 when the company was in dire straits. Without the generous salary and benefits givebacks of the Flight Attendants, totaling over $2 billion, American Airlines would have neither the capital nor credit needed to make such an ambitious purchase. The introduction of the Airbus A320 family places particular emphasis on the state of contract negotiations for all of the airline’s unionized employees who will need to be trained and certified to operate and maintain the new equipment. In 2003, APFA played a major role in keeping American Airlines solvent and out of bankruptcy by giving back an employee bailout of $340 million in annual salary and benefits, for a total of over $2 billion and counting. Today, American Airlines is one of the nation’s leading air carriers and after three years and over 125 meetings APFA is still in frustrating and stalled contract negotiations with company management. Laura Glading is serving in her first four-year term as president of the union. APFA was founded in 1977, the Association of Professional Flight Attendants (APFA) is the largest independent Flight Attendant union in the nation. 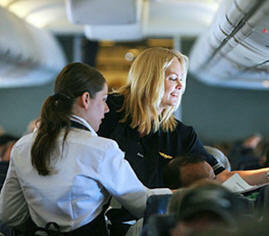 It represents more than 18,000 Flight Attendants at American Airlines. APFA Members live in almost every state of the nation and serve millions of Americans as they travel the nation and the world.